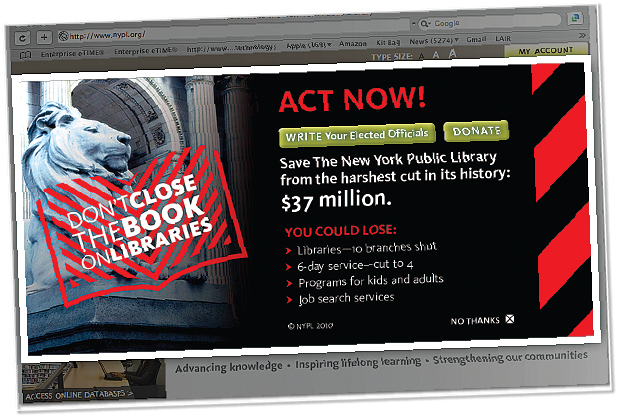 A potential budget cut of $37 million in spring 2010 motivated the New York Public Library to launch a 360 degree campaign centered around the line, “Don’t Close the Book on Libraries,” which incorporated a letter-writing campaign and an advocacy Web site that also measured engagement at each library branch. The letter-writing campaign dovetailed with the NYPL’s e-newsletter and other online efforts including Facebook and Twitter. The campaign resulted in 130,000 letters to the City Council, and $144,000 in donations—compared to $40,000 the prior year. How to educate the public about the importance of the Library Book Fund, which contributes to the public policy goals of literacy and lifelong learning? The Canadian Library Association found an effective champion in a Parliament member, who three times introduced a bill in favor of the fund, which is now making headway in the House of Commons. By creating a website to foster legislative advocacy and reaching out through public service announcements and conference presentations, Excellus BCBS contributed to the signing of a new New York state law that enables a patient’s family members to make healthcare decisions when the patient is unable to do so. 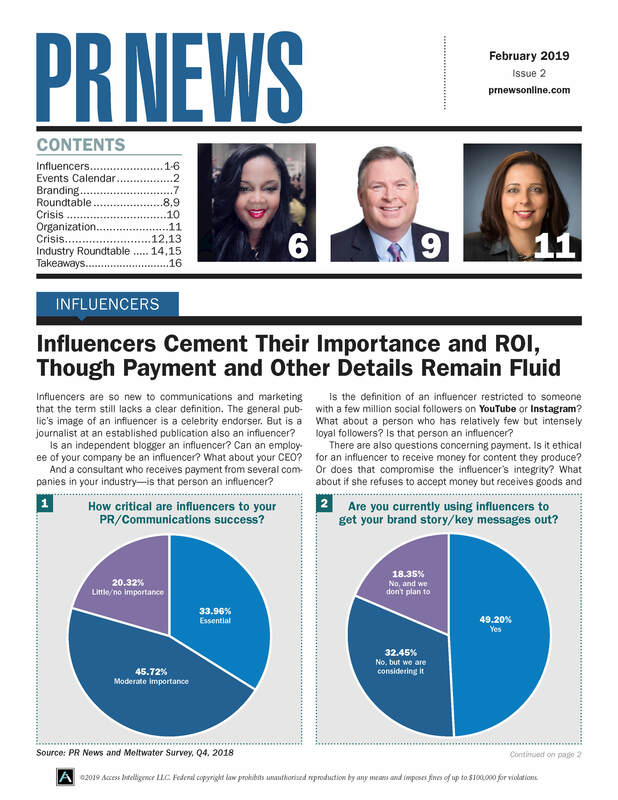 The campaign exceeded all regional benchmarks, including earning 62 media placements. Lifeline of Ohio, the not-for-profit group that promotes organ donation, teamed with Fahlgren Mortine PR to rev up donor registration among a population that tended to see the term as derogatory. By connecting through grassroots interactions and empowering existing ambassadors with cruiser motorcycle patches, the campaign contributed to the addition of 2,999 motorcyclists registering to become donors. To highlight the negative impact on the nation’s public schools if the Education Jobs Fund didn’t pass, the National Education Association spoke up via a cross-platform campaign including an educational website, Facebook, Twitter activity and broad media sweep. The results speak for themselves: The legislation passed the House in July 2010, and since the campaign’s launch 252,916 emails went to Congress through the NEA Web site and 82,000 calls went to congressional offices through NEA’s hotline. By focusing on strong branding and implementing a grassroots campaign that included the Internet, regular conference calls and presence in the press, The Sunflower Foundation of Kansas scored a clean sweep in its efforts to get a state law passed prohibiting smoking in public places. The Kansas governor signed the new Clean Indoor Air Act into law in July 2010.